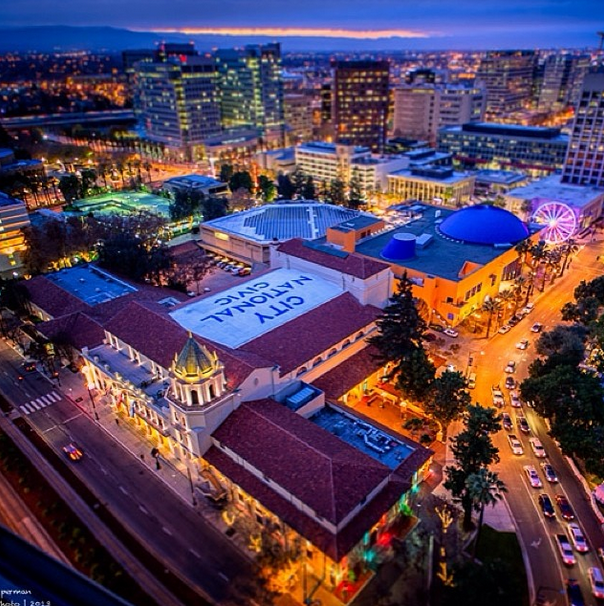 The San Jose Blog: The Knight Foundation Awards 13 Grants to Improve Downtown San Jose! The Knight Foundation Awards 13 Grants to Improve Downtown San Jose! Wreck Studios received $10,000 to creating “The Exhibition District,” a project to convert 40,000 square feet of vacant wall space downtown into an outdoor art gallery. San Jose Parks Foundation received $75,000 to expanding its “Summer in St. James Park” series of movie nights, concerts, exercise classes and other public events. Moveable Feast received $19,200 in support for a monthly pop-up dinner series in city neighborhoods where diverse city leaders will discuss and act in support of the future of San Jose. City ID, a New York- and London-based urban planning and design firm, will use a $129,927 grant to develop a “way-finding” strategy including signage and other ideas that would help visitors find the city’s Downtown amenities. Content Magazine/Silicon Valley Creates. The magazine received $75,000 to pursue ways to engage the community in city life and develop a sustainable business model. CreaTV received $11,250 to expand its “We are San Jose” storytelling campaign that collects video stories of city residents. Destination: Home, a project of the Health Trust to find solutions to the county’s homeless problem, received $75,000 for a feasibility study and fiscal plan to identify pathways for housing and employment for the homes. Downtown Streets Inc., a nonprofit that provides work opportunities for the homeless, received $25,000 to create a mobile coffee cart in St. James Park that would employ some of the homeless who congregate there. Greenbelt Alliance, a nonprofit that protects open spaces in the Bay Area, received $75,000 to help create “urban villages” composed of mixed-use, walkable neighborhoods with housing options across income levels. Housing Trust Silicon Valley received $75,000 to establish more affordable and equitable housing policies through educational, community problem-solving and research activities and partnership building. Joint Venture Silicon Valley Network/Valley Transportation Authority received $15,000 for “Hack My Ride 2.0,” a three-month online app design challenge open to anyone in the world and focused on transforming mobility in Silicon Valley. Metro Newspaper Silicon Valley received $10,000 to pay for a monthly full-page ad promoting SoFa. San Jose Public Library received $25,000 to reimagine underused spaces through the “Pop-Up Mobile Makerspaces” project with Okada Design.